Repsol Honda MotoGP rider Marc Marquez won the 70th race of his extraordinary career, as MotoGP fans were robbed a potential battle for the ages with Valentino Rossi crashing out of the lead in Sepang. Starting from the middle of the front row, Rossi got a perfect start and led strongly from the front. 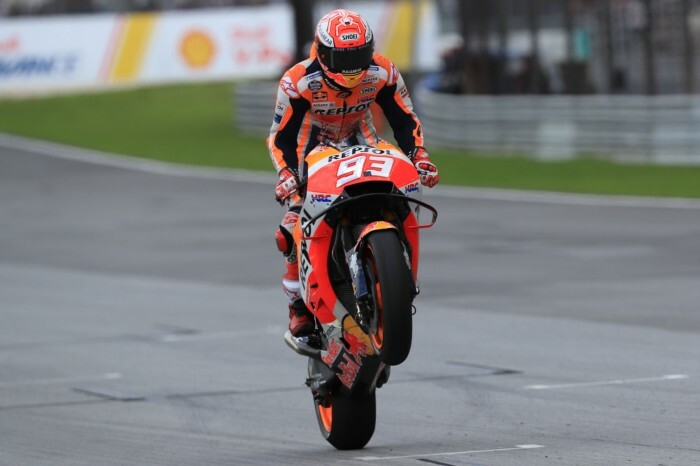 Despite his grid penalty, Marquez wasted little time in moving forwards and by the midway point of the race, the World Champion was up to second place behind the Doctor. With seven laps to go, Marquez started closing Rossi in and over the next three laps the gap between the pair dropped from 1.3 seconds to just 0.6 seconds. With a battle between the pair shaping up, Rossi lost the rear end of his factory Yamaha YZR-M1 going into the first corner with just four laps to go. It robbed fans of a chance to see a last lap battle between the pair at the scene of the crime from 2015, however Marquez deserves credit for forcing a mistake from the Italian who was riding impeccably. With Rossi crashing out of the lead, Johann Zarco was promoted to second and in turn Alex Rins now found himself on the podium. Not content with third position, Rins moved under Zarco on the final lap, leaving Zarco to third position. Maverick Vinales was fourth and was a victim of his poor qualifying position, with pace to match the front-runners, unfortunately he was just too far behind to have a real impact. Dani Pedrosa enjoyed his best result since announcing his retirement in fifth position, just ahead of the subdued Andrea Dovizioso who was sixth. Alvaro Bautista was back on his Angel Nieto Ducati and beat out the Pramac duo of Jack Miller and Danilo Petrucci. It was Hafizh Syahrin who rounded out the top ten with his own piece of history. The first Malaysian to compete in MotoGP at his home Grand Prix, Syahrin fought through from the back of the grid to finish tenth. Aleix Espargaro was eleventh, whilst Franco Morbidelli was the top satellite Honda in twelfth, just ahead of Stefan Bradl and Taka Nakagami. Bradley Smith rounded out the point scorers in fifteenth position.